There is a feeling of use like using hard five plywoods except when blowing, there is no feeling of being overdoing with light strokes or medium blows, and it is easy to draw an archwire for some reason why it is thin plate thickness and top plate Ram? I tried 145 in place of emerald to rosewood, but also tried 145, but each had a good disadvantage but it did not go very well but first I was surprised that it is lightweight but it is not pushed by the power of the opponent. The fine pre - can be done with the palm sense! Combination of wood and carbon is exquisite and you feel comfortable when you strike strongly when you do not want to feel the grasp feeling! As I pre-do it in front of you, it's lightweight and easy to handle around the racket! I like the hitting sound comfortably! Every one （Experience：２〜３ years）	The best one ever! I used various racquets so far, it is the best gem of the past. Even though it is an outer carbon, it is not quickly detached from the ball, it is like a wood racquet bouncing, so control performance is very high. Of course, the speed at batting is also satisfied, and the thickness of 5.8 mm has a gut feeling, I feel that it is a racket easy to hang on a drive. It is compatible with adhesive rubbers, but personally I like shot feeling in tension rubber. In front of this racket I was using Infinity VSPV, but as I got a lot of fun at driving and driving, I turned into a more aggressive table tennis. It is a truly amazing piece to change so much in a racket. First of all it looks good, it is cool without complaint, it is beautiful making of fluff. I was surprised to see it as a body that I used seven timber for years as a favorite because it is outer carbon on 5 plywood boards. 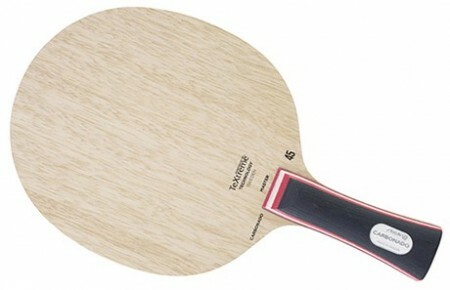 Even though it is outer, there is ease of use like a wood racket. First of all, Saab is also called adhesive rubber, so you can get short, short, low ones. Bass technologies such as stops, flicks, and chikitas will never get cranky and will fit firmly. Surprised by hitting the F drive, it got rotated, a high arcuate drive enters cleanly, entering. The B side also rises higher, so blocks and drives are quite stable. Even those who are resistant to outer carbon and those who are not experienced in special materials should be able to shift without impossibility, and should be able to increase rotation and speed! Reading the article that Chen Dream or Chu Ray Ling is using, it purchased a few months ago. First of all it was disappointing that it sounded like a cupon when I thought about the basic striking. Since I was using a racket with a good hit feeling until then, I felt the gap. However, from the coach of the school that is going through, this racket is a difficult racquet if you do not strike the drive firmly, so it is 3 months to continue using it as advice that it is better to keep using it for a while. Now, the impact is strong and it changes to a beating sound, the heavier ball than before was pulled by the archwire until it was sucked into the opponent's coat. Especially, the feel of striking the arc by back hand drive does not stop. Processing on the platform is easy to do from the beginning with both flick and ticketers, and there is no problem with the block. I tried using the previous Ace racket, and the momentum of the ball hit was considerably increased after all. However, because I kept using it for three months, I'm getting used to the feeling of Carbonado's hit and I will try to change the ace for a while. Something, I am excited with the expectation that my own table tennis will change in future. Alexandra （Experience：６〜１０ years）	Special material revolution! ! I do not know the special material that has been balanced so far. From Infiniti VPS, I changed the momentum and changed it so that I can handle it even in the middle team. With exquisite thickness of 5.8 mm, carbon is contained at an angle of 45 degrees, leaving wood feeling and raising the momentum. I thought that rotation would be reduced because it was carbon, but enough of the drive also draws an archwire, and the rotation amount did not decrease as it reached the serve. The platform is also easy. It is a mystery why Kasmin returned to Biscaria. . If you want to purchase, LEG grip is recommended. It was very easy to grip and the backhand became extremely stable. Although it was also listed in the STIGA catalog of this year, we will recommend here if it debuts on carbon as the hardwood series will be downgraded due to production of ANA, LEG grips only for current sales. I think that I can stabilize the pitch because it can speed up the pitch rather than strangely using 7 heavy rackets. It is a transition from intensity. With light striking, the feeling is heard in the hand with a medium bang with a very soft shot feeling. The speed goes far beyond 5 plywood. But I will not fly too much. Receive, block, bass player technology has a sense of stability because it does not bounce as much as 5 plywood. The amount of rotation of the drive does not correspond to 5 plywood, but it will take enough. The arc line is high. Smash speed is reasonably fast. What is good is the size of the sweet spot. Since there is a habit of scratching the back hand drive of the head at the tip of the head, even if it is out of the sweet spot, the ball will run and the ball will run. It is recommended to those who have fully used 5 plywood, seeking a sense of stability. Racket court is essential as the board on the front is the same as Infiniti.